Plot: While vacationing at their secluded Summer home an affluent family is terrorized by a pair of sadistic creeps. No matter how many times I see this film. It's powerful the first time as it is now since I first saw it over 13 years ago. I have probably seen it a dozen times and no matter how many times I view it, it still slaps you in the face and sends your emotional reality into overdrive as the dread, fear, suspense all tend to take over your mind and your body. You view this harsh, twisted, sadistic and truly powerful psychological crime horror film as if it's real. This is another one of those classic logical reality-based horror films on the idea of a home invasion. To me there is no greater fear and no greater horror then your own personal home being invaded and destroying that peaceful idea of safety. This is possibly one of the greatest psychological foreign horror films. A brilliant mix of thick suspense, terror, dread and most of all drama and the will to survive. Truly brilliantly directed. Awesomely written and amazingly stark, dark, deep, logical and plays with the viewers mind. It leaves a lasting memory. I must say that this was extraordinarily directed and when I first saw it and even when I return to it, it stills leaves an unrelenting imagery inside the viewers mind long after it is over. This film has a flawlessly flowing plot. Michael Haneke created perfection with this film. I have been a huge fan of him ever since I saw this film over 13 years ago, and he is one of those directors that knows how to bring emotions inside the viewer. He can build the drama and the suspense and a creative ordeal of power, or an uncontrollable situation. He places the viewer as if they are experiencing the torment and the tragedy, and the turmoil that is going on. One must spotlight the acting by all those involved in this film. The villains are brutally portrayed and brilliantly executed by Arno Frisch and Frank Giering. Both brought to life two of the greatest monsters on film. Each of them played off each other and gave two solid, brutal and complex characters. Arno Frisch is still acting today as of this writing. I think he is one of the most underrated and underappreciated performers ever. His ability to bring to life characters is flawless. His performance in Funny Games is a golden ticket of perfection. Shockingly and very sad inducing is that the brilliant Frank Giering is no longer with us. He died at the very young age of 38 years old. He brought the sadistic killer Peter to an award worthy reality in Funny Games and will always be remembered by the movie world, especially by me. Before his death he left 77 performances under his short life. Any movie lover or great performance lover should check out his performances. He was a very gifted German actor. Directed by one of the greatest directors, Michael Haneke. A director that I feel has not gotten the lime light stardom he deserves as a director. I feel he should be a household name. Many of his films are brutally executed into a realm of perfection. He has directed 4 of my favorite films. Besides Funny Games. He directed Benny's Video, Time of the Wolf both worthy of praise and must-see films, but the one that stands out, yes Funny Games I think is a top-notch film and is his 2nd greatest film, because my choice of his greatest film to date is the amazing, one of kind black and white masterpiece The White Ribbon from 2009 to me is his shinning reality and number one film. If you’re going to experience Michael Haneke's brilliance you must watch Funny Games and The White Ribbon. If you need to experience how to direct a flawless film, then you need to watch Funny Games and The White Ribbon. Both films define directing, acting, story, cinematography and camera work as perfection. Funny Games is a film that I will always praise. It's dark nature shines through his direction. Michael Haneke's films are created in a way that leaves the viewer breathless, and in amazement at how good a film can be. Seek out the four mentioned films, specially the original 1997's Funny Games and the brilliant 2009's The White Ribbon. Funny Games is a film that I highly recommend, yet I highly recommend it with a warning. For it's not for everyone, and certain individuals that experience this film might find it a little too powerful, and a little too dark. This is not a Hollywood film. This is not a film with a happy go lucky reality, for this is a film about the bad that meet the good. The innocent falling into the darkness. Falling into the clutches of pure evil humanity. This is about individuals who just happen to explore their animalistic nature of cruelty. For there is one thing brutally honest about humanity. Humanity can be some of the darkest, evilest species around. I think this movie explores the psychological makeup of humanity. We all have a nature inside us that can be cruel, and what we term as evil. For humanity can do some of the vilest realities. We all are capable of torture or murder but the good reality is, the majority of us are thankfully in control, or decide not to act on the horror that we can cause. Sadly, there are those few which in today's world seems like more and more as you watch the news, are choosing the inhumanity to man. Now there was a 2007 American remake of this film, written and directed by the same director Michael Haneke. There was no need to remake this film, because it was already perfection, but with that said it still was a worthy remake. It too played the realm of psychological brutality. Michael Pitt starred as the main villain and his performance was utterly fantastic also. Although I will always praise the original, the remake is worthy to praise also. Funny Games is the film that surprisingly gives you a picture of a greatest fear. The greatest destruction that man can do to man. 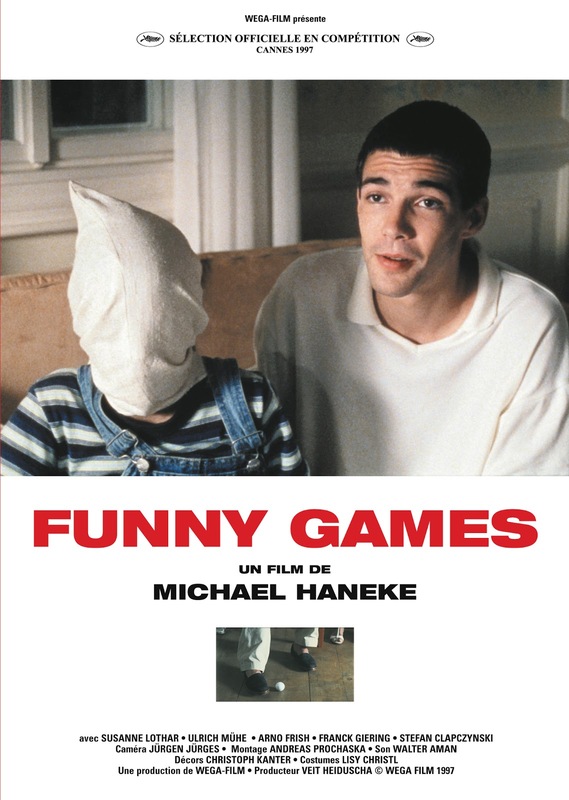 I believe Funny Games, believe it or not is something we can learn from. I think it's a film that plays on the line of understanding abnormal behavior, or understanding that in the spare of the moment, in the tick of the clocks hands, everything that we know can be shattered. Everything that we love can change. Everything that we hold dear can vanish. That idea of safety. That idea of protection, family, love, can all shatter in a heartbeat; by another's heartbeat.